Sulfotransferase that utilizes 3'-phospho-5'-adenylyl sulfate (PAPS) to catalyze the transfer of a sulfo group to an N-unsubstituted glucosamine linked to a 2-O-sulfo iduronic acid unit on heparan sulfate. Catalyzes the O-sulfation of glucosamine in IdoUA2S-GlcNS and also in IdoUA2S-GlcNH2. The substrate-specific O-sulfation generates an enzyme-modified heparan sulfate which acts as a binding receptor to Herpes simplex virus-1 (HSV-1) and permits its entry. 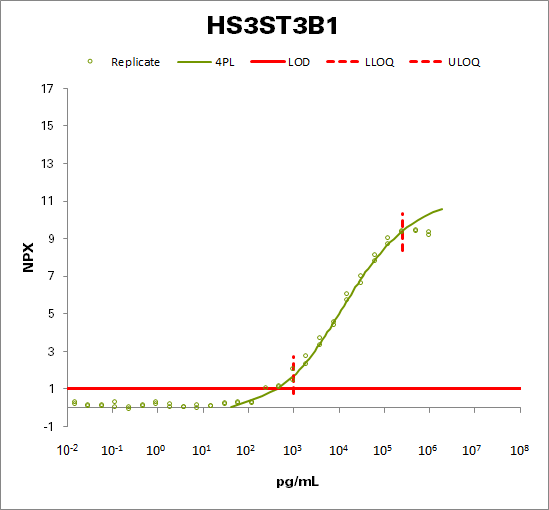 Unlike 3-OST-1, does not convert non-anticoagulant heparan sulfate to anticoagulant heparan sulfate.